Machine Simulation is a way that you can verify your program and tool paths in NX CAM. You can replace the generic machine in the Machine Tool View with a machine from your library in NX CAM, all available out-of-the-box in NX. You can also create your own simulations and add them to NX. PROLIM also offers a variety of Machine Simulation options. and ensure there are no collisions. An example of machine simulation inside NX CAM, with a specific machine already loaded and the sheet metal sides of the machine hidden from view. Taking advantage of integrated simulation in NX CAM gives you an opportunity to see how everything will work before it goes to the shop floor to be manufactured. You have the options to run the Machine Code Based Simulation—the actual G-Code that it will post out—or the NX Tool Path Based Simulation, running the NX language in the background. You can also bring in your own NC Program. and running your own NC Program. 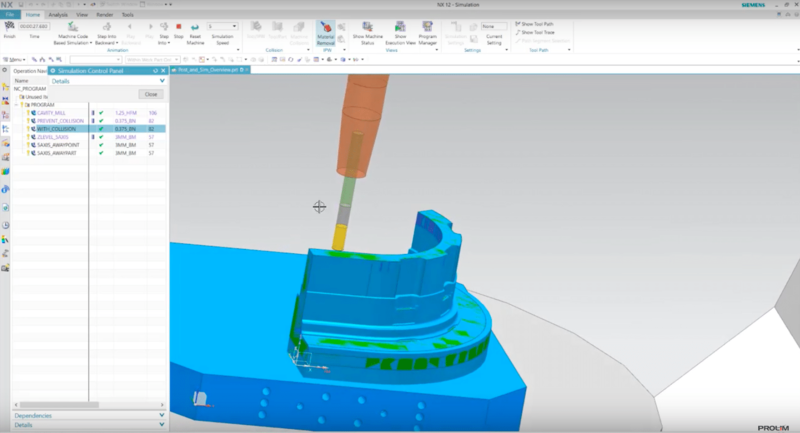 Interested in learning more about NX CAM? Check out our NX CAM training options, or visit our YouTube channel for a variety of NX CAM videos.